July 4, 2013, Victoria, BC (ISN) – Victoria Highlanders FC faced off in the annual Charity Shield Match Wednesday evening, facing off in a friendly against Victoria United FC. At the three-minute mark of the opening half, Wesley Barrett flipped the ball to himself to free up the ball, before getting a shot off that went high. 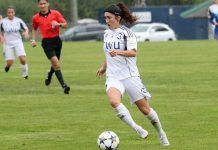 The Highlanders continued to play in Victoria United’s zone following the chance, with Victoria’s Josh Heard being taken down several times in the opening 10 minutes. Victoria United received their first shot in the Highlanders zone at the 11-minute mark, but the shot would go wide. Victoria United’s Patrick Neilson received a solid shot against Rab Bruce-Lockhart in the 25th minute that the Highlanders ‘keeper would handle without issue. At 36-minutes Cam Stokes would feed Josh Heard with a cross-pass, but Heard would be unable to finish it. Following the Highlanders chance, Victoria United received two opportunities of their own, firing hard shots but being unable to beat Bruce-Lockhart. Late in the half, Wesley Barrett received his second scoring opportunity, firing yet another blast from just outside the 18-yard box that would also go high. Barretts chance would be the last opportunity in the half, with neither side able to find the back of the net. To open the second half, the Highlanders made several changes to their lineup, inserting Brett Levis, Riley O’Neill, Gareth Langdon, Andrew Ravenhill, Jordie Hughes and Craig Gorman and Elliot Mitrou in net. The Highlanders would convert in the 64th minute, with Sahil Sandhu converting a penalty kick after being taken down by Dom Colantonio, putting the Highlamders up 1-0. In the 69th minute, Tyler Hughes took a free kick from 18-yards out that ‘keeper Hulstein dove to his right to save. After Victoria United received another great opportunity on Mitrou, Brett Levis got a chance of his own in Victoria United’s end, firing a shot that was swallowed up by the ‘keeper. With several regulars inserted into the lineup for the second half, the Highlanders controlled a majority of the play. 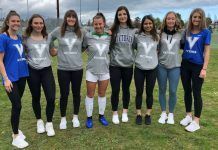 As the half came to a close, Victoria United pressed, firing several shots towards the Highlanders net, but it would be the Highlanders who would net another goal, when Craig Gorman fired one into the back of the net in extra time to seal the victory. The next Highlanders home match takes place Saturday, July 13. The double-header begins with the Co-op Highlanders facing off against Okanagan FC at 5:00pm before Highlanders take on Portland Timbers U-23 at 7:30pm. For more information please visit www.victoriahighlandersfc.com.